Skillet Beef Nachos are a great way to bring the fun to any occasion! 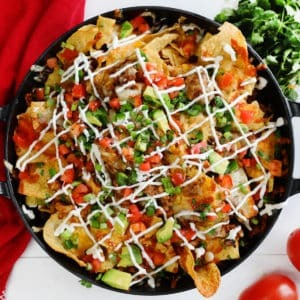 Layers upon layers of warm tortilla chips loaded with flavorful, seasoned ground beef, gooey cheese, and loads of fresh veggies, this dish is bound to make anyone's day just a little brighter. In a medium bowl, combine cooked hamburger, cooked onion, refried beans and taco seasoning. Mix well. Add 1/3 the tortilla chips and top with beef-bean mixture, 1/3 of the cheese, 1/3 of the black beans. Repeat two more layers. Bake until cheese is melty, 10 minutes. Top with tomato, avocado, green onions and cilantro. Drizzle with sour cream.